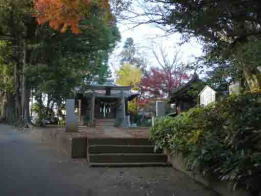 The two stone coffins of Akedo Old Mound are designated as the municipal cultural assets of Ichikawa city. 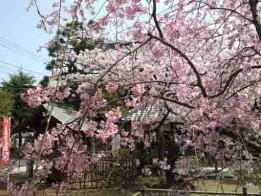 They are placed on the hill in woods in the north-western area in the park. 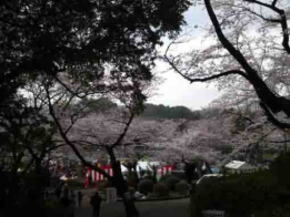 The hill must be Akedo Old Mound. 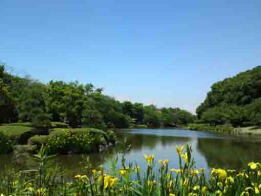 There are several old mounds near the park, Hokozuka and Guhoji Old Mound are famous, so many people could had lived in the area in ancient time. 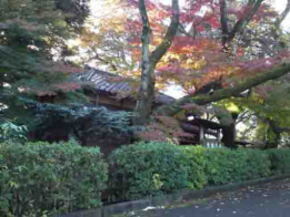 Some legends said that the stone coffins were had found by Dokan Ota when he had built Konodaijo Castle (now in Satomi Park) in 1479. 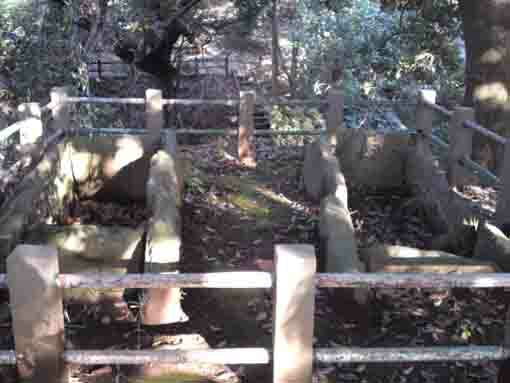 In Edo Period, the coffins were said to be tombs of Satomi Family who had lost the battles of Konodai but Edo Meisho Zue introduces them as the tombs of ancient people. 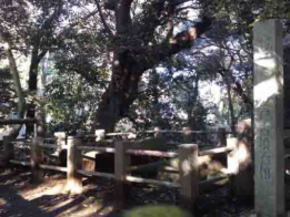 The cover stones of the coffins are now used to be the pedestals under Yonakiishi (the stone cries at night) in Satomi Park. The two box shaped coffins were put together some pieces of chlorite schist. Akedo Old Mound is a keyhole shaped tumulus built from late 6th to early 7th century, it is an important historical property that implies that there were several thousands of people lived in the area. 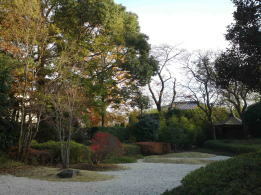 Why don't you visit Akedo Old Mound in Satomi Park? 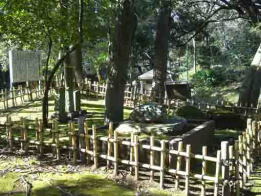 Akedo Old Mound is a 40 meters long keyhole shaped tumulus. And many haniwas made in late 6th century excavated around it. There are two box shaped coffins combined some pieces of flat stones set on the top of the round shaped rear mound, even now they are on it. 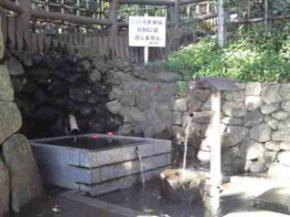 To observed an old picture of the coffins, the covers of them might be put under Yonakiishi (the stone cries at night). The stone using them are biotite gneiss called Chikushiishi that were quarried at Mt. 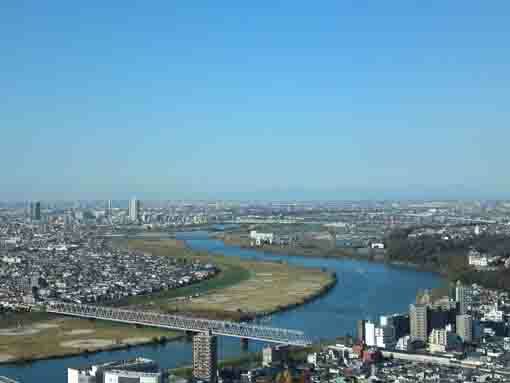 Tsukuba and were brought by ship passed through Kasumigaura Lake, Teganuma Lake and Edogawa River. These two stone coffins are introduced in Edo Meisho Zue published in 1836, and it says 'The stone coffins are two on the same place. 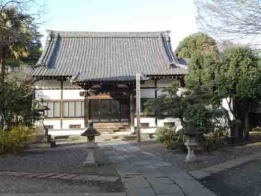 A priest in Soneiji Temple told the coffin on the north would be Hirotsugu Satomi, the eldest son of Tadahiro Satomi and another one could not know whose it would be but it might be the chief retainer of Satomi Clan, Nizen Masaki's. For several hundred years ago, the mound collapsed and the two coffins appeared on the earth. 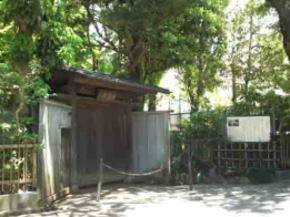 At that time, some swords, armors, helmets, gold and silver bells, drums and haniwas were put in them, and a few of them are preserved in Soneiji Temple. It could be the tombs for ancient people. The stories told by the priest could be false.' We could know that the stone coffins had appeared on the earth in 19th century and what had found from them. 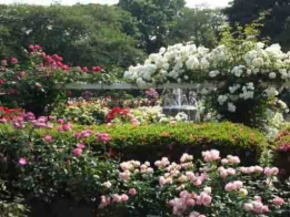 The Stone Coffins of Akedo Mound in Satomi Park has great accessibilities from both Narita and Haneda International Airport.